Catfish are an excellent choice of aquarium fish, keeping them in your home aquarium allows you to experience these amazing fish and witness the peaceful life they live. But what’s the Best catfish food you can give them? 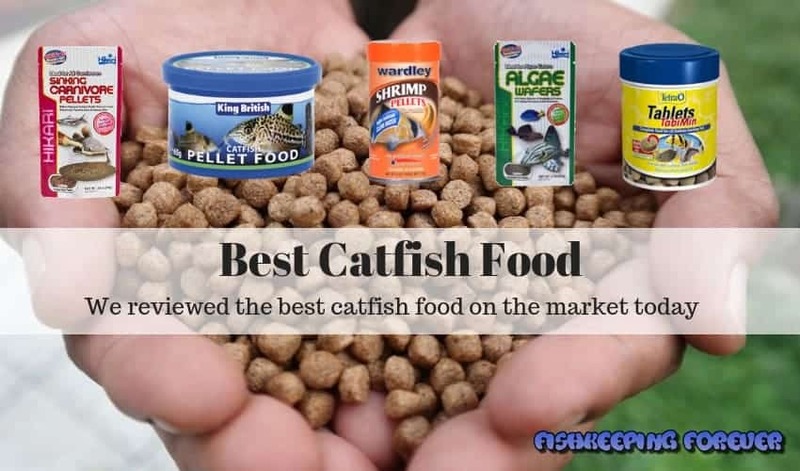 We thought it would be helpful to review the Best Catfish Food in 2019 to help your catfish receive the correct foods they need to thrive in your aquarium. Catfish are also one of the easiest fish to take care of as they do not demand too much attention and their habits are easily understood. If you are a busy person who does not have a lot of time to keep an eye on your fish then you need to buy some freshwater catfish. However, before you invest in an aquarium and catfish, you must know all about them to be able to give them the best chance to thrive in your fish tank. 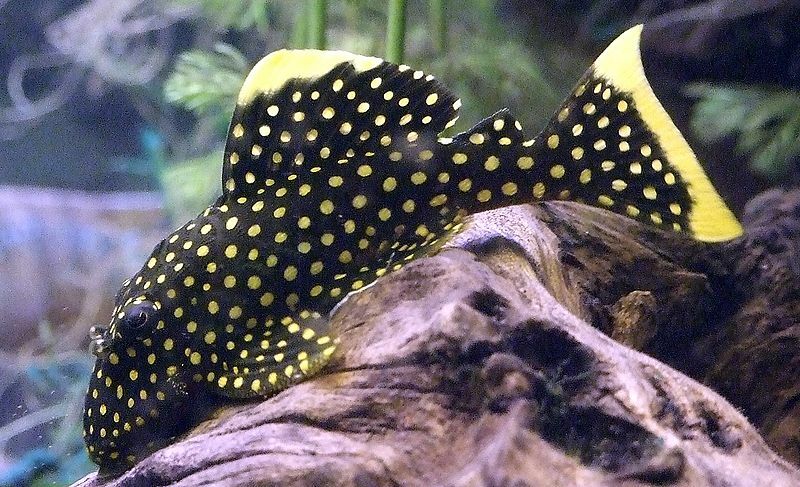 Catfish are accustomed to eating a well-balanced diet in the wild and as a responsible aquarist, you have a responsibility to provide this in the home. Unless you’re keeping catfish like Redtail Catfish or a Shovelnose Tigerfish then the cost to feed them shouldn’t break the bank. They like to be fed different types of food including algae, dried foods, pellets, and live foods. There are many different brands producing food for catfish and it can be difficult to know which one to use. Many brands like Tetra and King British have been providing quality catfish products to the customers for years now and their products have all the goodness your catfish needs. However, the slight differences in the ingredients make the quality of foods vary in each product. The reviews given below will help you to pick the best food for your catfish. Developed after extensive study and analysis of the sense of sight, smell and taste of numerous carnivorous fish. Inclusion of key ingredients like DL-methionine and L-lysine allowed us to produce a food most bottom feeding carnivores devour readily. The Hikari foods available for catfish is a mix of all the favorite ingredients. We used this product for a month to see the long-term and short-term effects of the item. We found out that this diet was actually very unique for the catfish as it gave them a taste of the wild foods. Another benefit of these pellets was that they quickly sunk to the bottom of the tank. This meant that the fish swimming at the top did not get a chance to consume them immediately and the catfish could easily get their share. 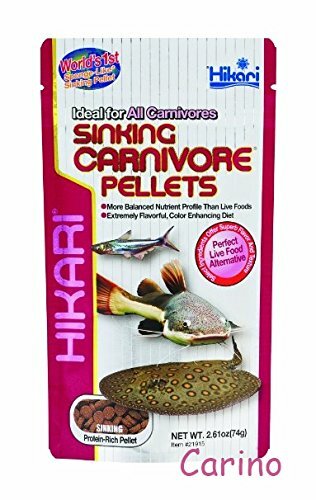 The tropical sinking carnivore pellets are also good for the health of the fish. They contain a high level of vitamin C which increases the immunity of the fish. The protein content is also high which matches that of the live foods these fish east when they are at sea. – A slightly expensive food that can increase your costs in the long term. A mixture of everything that is liked by your catfish, the Super Catfish shrimp, and krill mix is one of a kind. To make your fish satisfied with what they eat, there are color enhancers added to this product. After using this product, it became apparent that the catfish were attracted to the color and ate the food easily. There was no issue in their diet. The food is also cut into small pieces. All you have to do is pour it into the fish tank. You do not have to get your hands dirty. For the customers, the best part about this catfish food is that it does not get rotten anytime soon. The company has paid special attention to the packing and storage aspects of fish food. They pack it in ziplock bags which protect the food from any external threats. The company policies regarding shipping are also appreciated. – Cannot be used in excesses because the ingredients are a bit heavy for the fish. This Catfish pellet food is suitable for all kinds of catfish. Usually, when the food is being manufactured, the companies tend to ignore the ingredients which are commonly consumed by all the catfish. They go into more specific things. This does not work in the long term because the fish will not eat the food. The food is also packed in a box and comes in 65 grams boxes. While giving the catfish pellet food to our fish, we noticed they got healthier sooner than when we were giving them the other food items. But we also noticed that this was unusual and after researching it was found out that the food contained some strong chemicals. These chemicals should not be consumed by the fish in the long term. These are to be used if the fish are not well. Such a precaution is necessary. Algae Wafers were specifically developed for the hard to feed plecostomus and other algae eating bottom feeders. Hikari was the originator of this diet, now copied by many. The Wardley Shrimp Pellets were made after a lot of research. The various scientists who had been working with fish got together to make a food item that resonated with the exact needs of the catfish. They came up with a product that sunk to the floor quickly and helped the catfish to consume the food in proper amounts. The packing of the pellets is also ideal. They come in a vertical jar which you can store in any of your kitchen cupboards. The pellets contain a high quantity of protein because catfish need more protein to live for a long while. The foods are also high in Vitamin C. The idea is to give the fish a well-balanced diet. Their immune system becomes stronger and they will not get sick. 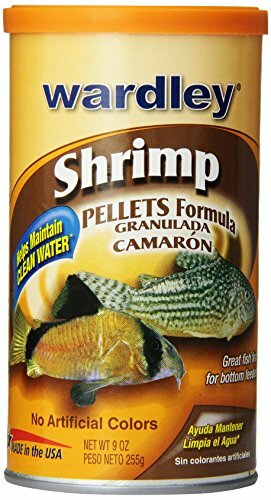 If you want your fish to be more stable, you need to get this food item today and start feeding them the pellets regularly. – It is one of the most well-balanced diets for catfish. – It is not expensive as compared to the other food items available. – It is easy to store. – The pellets are a bit bigger in size so they might have to be crushed before feeding to the fish. An original of the Hikari Company, the tropical algae wafers are one of a kind. They were produced to feed the fish which like to stay at the bottom of the fish tank. In a real environment, the bottom contains lots of algae so these fish can have access to the algae which they can eat. But in a fish tank, the place is cleared up and there are no algae items. To counter this, the company produced wafers which easy to digest and also were something the fish were naturally used to eating. After using the wafers, we noticed that they could not be stored for longer than a week. The wafers tend to get soggy and when they are fed to the fish, the fish do not eat them. So do not get this food in many packs and just bring them in small quantities. – It is easily available in every fish food store. – The packing is very weak and the products tend to soggy only after a few days. One of the highly advanced companies which have not only been providing high-quality products to the customers but also pays attention to the overall packaging and style of the food items, the TetraMin is not new in the market. Their complete diet tropical tablets cover all there is to the diet of catfish. They have added rich ingredients to their mix making it highly useful. The ProCare is healthy and the tablets sink to the bottom as soon as they are immersed in the water. When giving your catfish this food item, you must ensure that you do not overdo it. The meal should be well-balanced and should be checked. 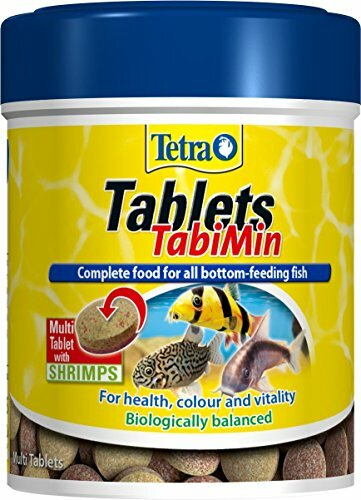 Some catfish tend to overeat these tablets. But this is a normal trait and they are not harmed. The storage of these tablets is easy and can be maintained by anyone. – You need to keep a strict check on how much food you are giving to the catfish. Flake foods are the dry foods that most people use when they first start keeping fish. Getting your catfish to eat this type of foods might take some time because these are not the natural food they are used to eating. These are made designed by companies for the mass market. Flake foods should be given in small amounts because they take time to sink in and can stay on top of the aquarium until they finally sink. However, by this time most of the other fish that feed on the surface or middle water level have eaten all the flakes which leave nothing for your catfish. Although live foods are not the first choice for tank fish as they need to be purchased from your aquatic store or pet store, they can be used if the fish are not eating the flake foods you are feeding them. Live foods or frozen foods can be anything that the fish usually eats in its natural environment, there are hundreds of different varieties on the market today. They do not contain all the nutrients and vitamins that are needed by the fish but they are a treat. You can get live food from any pet shop. They do not cost a lot as the quantity is less, normally one small bag is enough for 1-2 feeds maximum. Types of live food are brine shrimps, bloodworms and Mysis shrimps and for saltwater, fish copepods are a good choice. Sinking pellets are specially manufactured for the fish that stay and live at the bottom of your aquarium like catfish. Catfish are also bottom feeders so one of their main diets are the sinking pellets. Most of the major manufacturers make good sinking pellets that sink within a few seconds, some of which are in our list above. They are consumed by the fish easily as most of the other fish are eating the dried flake food floating on the surface. To make sinking pellets more desirable, various enhancers are used and the fish are attracted to them. Algae wafers cannot be considered as a staple diet for any fish and especially catfish. These are mostly to be treated as snacks because algae does not provide them with all the good nutrients they need. 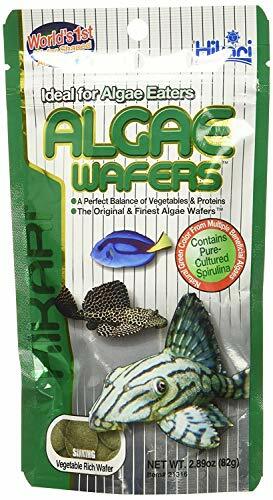 These should be given every once in a while to the fish and that too love algae, if you have a clean and well-maintained fish tank there shouldn’t be too much algae so providing that extra algae content into their diet is well worth doing. Many companies are producing algae wafers but the ones we have mentioned above are the most suitable and give you a high quality of products. 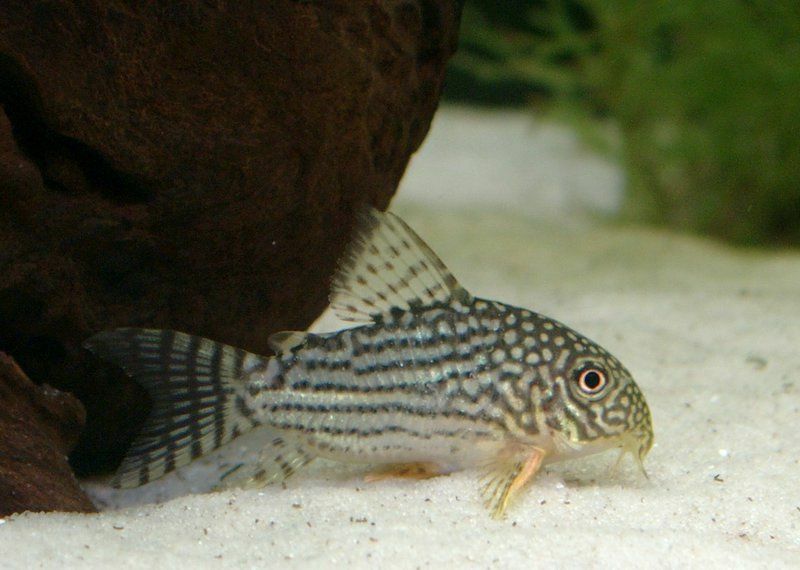 After reviewing and testing many catfish foods we found that our Corydoras liked the Hikari Sinking Catfish Pellets the best. 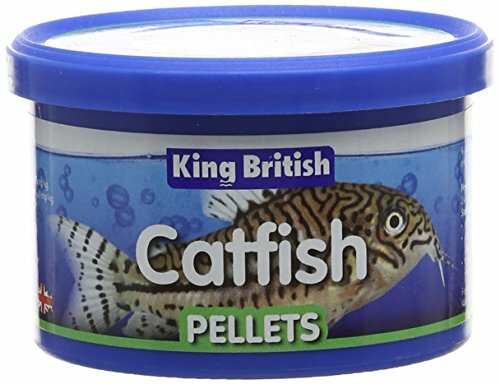 We loved them so much we have done a full review on this product Best sinking catfish pellets. 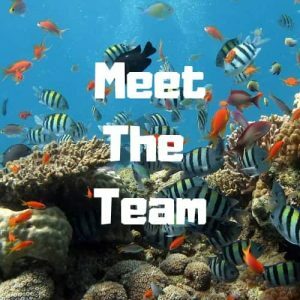 Keeping your fish tank clean is very important when you buy fish, it’s our responsibility as a fish keeper to provide the best possible environment for our fish. If you keep on adding fish food to a tank that is dirty, it will only pollute the water and make the fish sick. There are several things you can do to keep the fish tank clean. The main one is using a filter to take out food that has not been eaten by the fish. This food will go to the bottom of the tank and start rotting which will produce toxins which can be hazardous for the fish. Another thing to notice is that the food items should not contain any color. If there is extra color added, it will contaminate the water in the tank and you would have to do a complete purification process. Most of the color found in foods made these days are natural colorings from the ingredients. Another important thing to remember while feeding your catfish is to not overfeed them. With fish, one of the main issues is to know when to stop. Overfeeding results in the direct killing of the fish. When you add too much food to the fish tank, it will get to the bottom and remain there until it is properly cleaned. Secondly, the fish will over consume and then produce more fish waste. The fish waste gathers in the tank and the nitrates and phosphates this produces can be very harmful to the health of the fish. It is quite common that when you first buy a fish you will be excited and because the only interaction you have with them is when you feed them, you can do it more than is necessary. It’s all part of learning and we all make mistakes. Read our latest article 30 FISHKEEPING MISTAKES BEGINNERS MAKE this will help you avoid some of the pitfalls we all made when first starting out. We hope you found this article on the best fish food for catfish helpful. Let us know and comment below what you feed your catfish and why. If you’re thinking of buying your first fish tank you might want to read our complete guide to starting a fish tank for beginners. Thanks for reading and happy fishkeeping forever!